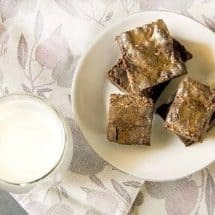 Five Ingredient Keto Flourless Chocolate Brownies are moist, delicious, and have 3 gms of carbs per serving. These taste just like the real thing! If you don’t want to rush out and try my Five Ingredient Keto Flourless Chocolate Brownies because they’re not as pretty as some of the others you’ve seen, that’s cool–but you’re totally missing out. These are moist, light, and no one can tell they are baked with something other than sugar, and with no flour. I did this the lazy way, using a microwave rather than a double-boiler because really, I’ve seen no differences in how the two work, especially if you’re careful to not overcook the chocolate in the microwave. I also used my Vitamix to blend the living daylights out of the batter to get a lighter texture. Okay, this is where I admit I was trying to make a cake, but really, it wanted to be a brownie. Who am I to argue with a dessert’s desire to reach its full potential? Call it a cake, call it a brownie (it’s really more like a brownie) it’s absolutely delicious. It was so easy, I felt silly for not having tried it earlier. I did make an AMAZING Keto Chocolate Cake that’s nut-free, gluten-free and low-carb and is so very good. 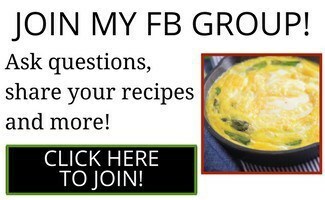 Click HERE to see that recipe! Melt butter and chocolate chips in the microwave. Blend eggs, sweetener, and vanilla in a blender. Mix and bake at 350F for 35 minutes or until a knife inserted in the middle emerges clean. Gowise Air Fryer or Philips Avance XL or Breville Smart Oven Air or just your regular oven. 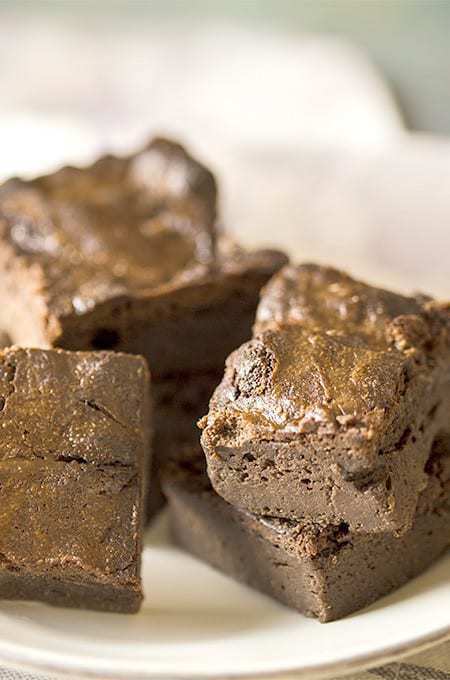 The best five-ingredient keto flourless chocolate brownies you've ever made! Taste just like real brownies. 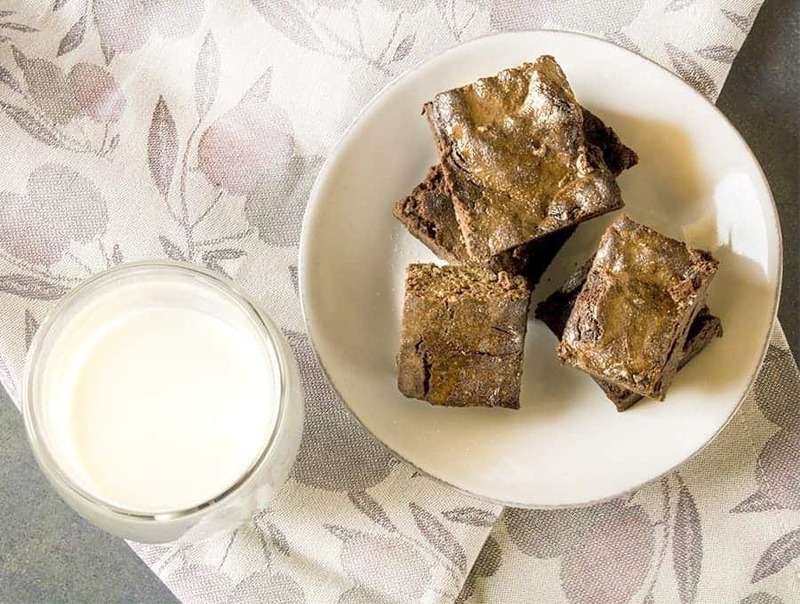 Five ingredient keto brownies taste just like the real thing! 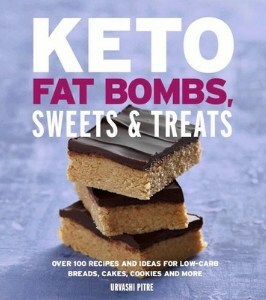 Gluten-free, low carb, and keto--plus most importantly, delicious. In a microwave safe bowl, melt butter and chocolate for about 1 minute. Remove and stir well. You really want to use the heat within the butter and chocolate to melt the rest of the clumps. If you microwave until it's all melted, you've overcooked the chocolate. So get a spoon and start stirring. Add 10 seconds if needed but stir well before you decide to do that. In a bowl, add eggs, sweetener, and vanilla and blend until light and frothy. Pour the melted butter and chocolate into the bowl in a slow stream and beat again until it is well-incorporated. Pour the mixture into greased springform container or cake pan and bake at 350F for 30-35 minutes until a knife inserted in the center emerges clean. What size pan did you use for this recipe? I don’t see any indication of what size cake pan to use. I have a 9-inch square cake pan. Would that work? My springform pans are rounds, which doesn’t seem like the best pan to use for brownies. Can I use a different pan? My springform pan is a 9″ pan and thought it may be too big. Yes I’d just use any pan and grease really well. I made this and it tastes fantastic!!! But after it puffed up and then collapsed, it’s flat like a pizza crust. I used a standard size springform pan. Is that normal? Yes and I don’t know why! It always puffs up and then collapses. I mention that in the post too. Could you tell me how many ounces of chocolate chips you used? I’m probably going to use a chopped up chocolate bar instead b/c I don’t have any sugar free chips on hand. Thank you!! I tried making this for my son, but for some reason it came out puffy like a puffed pastry instead of brownie consistency. What went wrong? Tasted good though! Sounds overbeaten. Mine did the same the first time. A similar thing happened to me… I followed the recipe exactly, whisking the eggs by hand so they wouldn’t be over beaten. I added walnuts, but otherwise did not change the recipe at all. Mine puffed up almost like a chocolate souffle. The weirdest thing. it does puff up and then it collapses. I too am not sure why. All I know, is that it tastes good once it’s collapsed. I don’t know about monkfruit since I’ve never used it. But it is not at all eggy. It’s chocolatey! I love monkfruit. I find it generally less sweet than other sweeteners, though, so the first time I made this recipe with 1/4 cup Lakanto monkfruit. It really didn’t feel sweet enough and it was on the eggy side, especially when it was still warm/room temp. Better when chilled. The second time I made this recipe I used 1/4 cup swerve (erithrytol) and I thought it tasted great! Have you looked into cacao powder that’s even healthier? I haven’t. I need to read up about how to sub powder for chips. I think I may need to add more butter. But that’s easily doable isn’t it? I like that idea. Thank you! Ok, tried making this. Tastes like actual brownies and not some proxy. So good with coffee. Might want to edit the steps to say when to add the chocolate to the eggs – put eggs into bowl of chocolate, or chocolate into blender and whirl again? I’m sure you can use whatever else works better for you. Lots of options. Truvía® Baking Blend is made from erythritol, sugar, and stevia leaf extract. Didn’t have any. Amazon delivery delayed and I don’t post anything I haven’t tested so I posted it with what I used. Keep scrolling if they didn’t like it ? Yes, he will make this and I will supervise as he is a quite advanced baker. 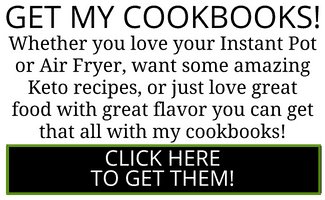 I’d prefer to halve this recipe as I’d like to avoid too many leftovers and also am unsure about this recipe. It looks quite a bit like baked custard with the texture of brownies. I’m not keen on chocolate cake so hopefully the boy enjoys it. You will love this one. Trust me. And send the rest home with him. Don’t halve it. It doesn’t make a huge heck of a lot. That’s like a 6-inch pan in that pic and it wasn’t even half full. Utterly perfect timing yet again, the universe seems to have a connection from your kitchen to my recipe needs. Flourless chocolate cake is my nephew’s favorite and I was hoping you’d have a go to I could use. Mod question: I have 90% cacao bars and also unsweetened cacao powder. I was planning to sub in equal grams of each for the choc chips. I’m wondering if I might need to counter with some additional fat for moisture? Thoughts? So don’t use the cocoa powder the first fine. 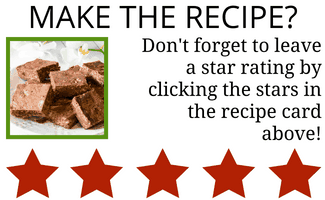 Use the 90% cocoa bars and add a little sweetener. Also these are so simple to make, Boomer could help you make it. Hold off on the cocoa. I have a plan for a cocoa-based chocolate cake. It would mess up the texture in this.